Events at Secrets The Vine Cancun! At Secrets Resorts & Spas, we always have something going on. From the everyday relaxation you’ve come to expect, to the events the Entertainment Team brings to life to celebrate any and all holidays. For example, we have quite the night planned Tuesday when Secrets The Vine Cancun turns two years old! But that doesn’t mean we wait for a holiday or special occasion to do something special. At Secrets The Vine Cancun, this week is the perfect example, with even more events you’ll want to hear about! First try something new and start your Wednesday right with our Spa Party featuring the luxurious skin care line D’vine! Meet us at The Vine Lounge Terrace at 9:30 a.m. to try some new products and get serious about relaxing on your vacation. Click here and get a full look at the gourmet menu to be served! Second, bring your appetite and your wine palette when wine maker Julio Pérez del Rio visits and bring his expertise and plenty of Santa Carolina wine. Join us on Thursday, August 21st at 8:00 pm at Nebbiolo Restaurant for this delectable evening. Enjoy a full four-course meal with expertly paired wines for every bite. For guests, there is an additional cost of $44 USD. Both events are only the beginning! Check our events calendar to see what else we have in store and check out our special offers. Find the perfect time to plan your escape and visit us! 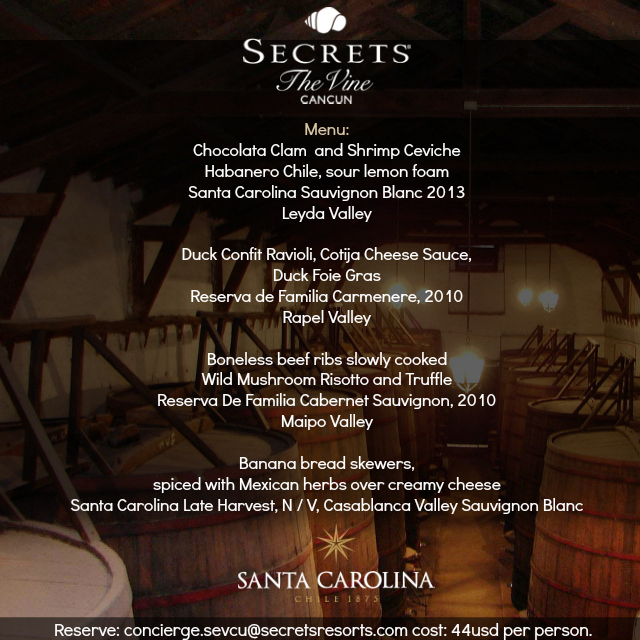 This entry was posted in Secrets Resorts & Spas, Secrets The Vine Cancun and tagged D'Vine, Julio Pérez del Rio, Santa Carolina, Santa Carolina Wine, Secrets Resorts & Spas, secrets the vine cancun. Bookmark the permalink. ← Happy Birthday to Secrets The Vine! These are truly impressice ideas in about blogging. You have touched soome good things here. Any way keep up wrinting.